As a born and bred Florida A&M University Rattler and as a graduate of Morehouse College, I, like many other graduates and supporters of America’s Historically Black Colleges and Universities (HBCUs) stand in full support of the Bethune Cookman University students who protested Education Secretary Betsy DeVos yesterday. Why? It is because DeVos works for one of the most brash, ill tempered, ill mannered, illogical, intellectually inept and insidiously racist men on the planet — Donald Trump. You see, some of the same folks on my social media timeline who are calling the BCU students “ignorant” and “classless” utter nary a word when the typically ignorant Trump and his classless surrogates pop off racist rhetoric that suggests that all Blacks are poor, criminally pre-disposed, and having to dodge bullets just to go to the corner store. Some of the same folks chiding the BCU students for their deportment do not chide Trump when his puerile behavior, replete with Twitter Tantrums against friends and foes alike, makes him and America the laughing stock of the Free world while placing us in danger of further terror attacks and global nuclear war. But most crucially, neither Missy DeVos, arguably the least qualified education secretary in history, nor her boss Massa Trump, certifiably the least qualified President in my lifetime, care much about the hopes and fears of those young men and women who graduated from BCU today. These young Brothers and Sisters will face uncertain job markets not just because of an economy that improved under President Barack Obama and yet still needs further improvement, but because systemic racism impacts whether they will get interviews for certain jobs, whether banks will lend to them for housing or small business capital, and it impacts the quality of health care they will receive for themselves and their families in the future; DeVos and Trump could not care less about this reality. Just last week, Trump questioned whether prior funding for HBCUs violated Equal Protection principles, this only weeks after a highly publicized photo-op with HBCU presidents at the White House. Further, many of these young grads, no matter how many advanced or professional degrees they earn, still will be young Black men and women in an America where wealth and law abiding status do not always shield Black folks from some reckless police officer who shoots first and asks questions later because of an irrational fear of people of color. 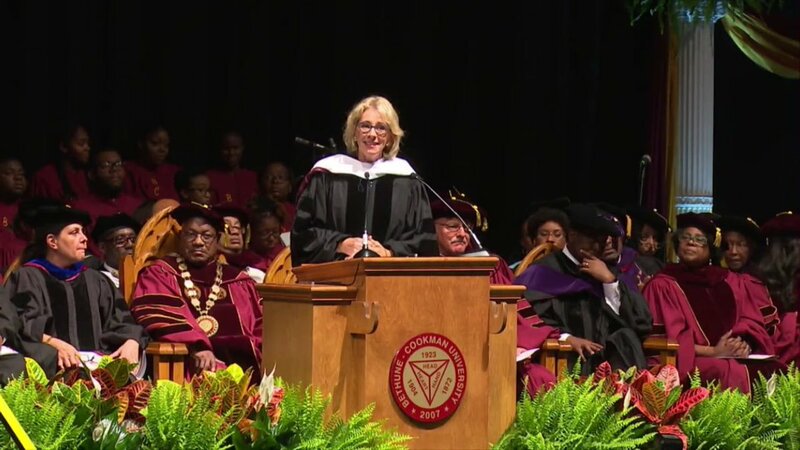 And because DeVos works for a man who screams and Tweets #BlueLivesMatter whenever an officer dies in the line of duty while refusing to honor or say the names of unarmed Black men, women and kids who are wrongfully killed by the police, it is clear that neither he nor she care about what is really on the hearts and minds of these young BCU grads. Friends, it is not about rhetoric, it is about a record, and the record shows that Trump and DeVos do not line up with the social concerns or the politics of the overwhelming majority of BCU students and stakeholders. Ditto for those of us across the greater HBCU family and Black America writ large. Cognizant of that, BCU’s Republican President Edison Jackson was unwise to invite a woman from an administration that lacks both a record or rhetoric that would be beneficial for these grads to hear on their special day and he, like she, deserved every decibel of each boo that they received today. As erudite and bourgeois as I am, had I been there today, I would have raised my booming baritone voice to boo DeVos and Jackson, too. Those of you who are put off by what transpired among the graduates yesterday need to look in the mirror and ask why you would hold a group of young folks to a standard that you are unwilling to use to check Trump and his other merry minions, like DeVos? The answer, if you are real with yourself, could prove telling.